Vocalist Fidel Kilic, born in the diverse and historic city of Mardin in Southeast Turkey, came into the world as the 17th and last son of Kurdish farmer parents. His mother was a dengbêj, a term in Kurdish oral culture that denotes people who sing-speak epic stories, so he was inspired from an early age to perform. 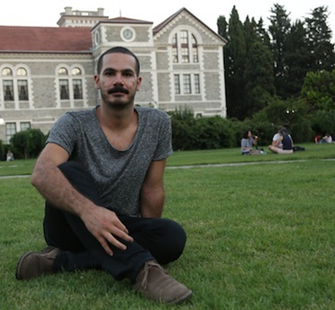 It was at the Boğaziçi University Folklore Club (BÜFK) in Istanbul that he began exploring his voice in earnest, learning the vocal traditions of Kurdistan, Turkey, the Balkans, Greece, Armenia and Georgia. After meeting the acclaimed folk music band Kardeş Türküler (Songs of Fraternity) at BÜFK, he became part of a community of artists that includes renowned musicians such as Arto Tunçboyaciyan Aynur, Ara Dinkjian and Christopher Tin. Kardeş Türküler’s album Çocuk (H)aklı (featuring Fidel as a vocalist) was nominated for a Grammy under the “Best World Music Album” category in 2011. The group also became involved in the Occupy protests in Taksim Square, with their protest video "Tencere Tava Havasi" attracting over two million YouTube plays. Fidel is currently working on a theater production focusing on the peace and conflict resolution process in Turkey and plans to see his project staged in 2015.